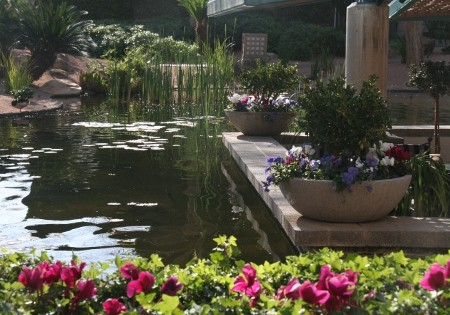 Scottsdale is a great place to go for sunshine, golf, Spring Training Baseball, or gallery hopping. If you plan a getaway to Scottsdale, I want to recommend two places to stay. One is a small boutique hotel in old town and the other is a full service resort in north Scottsdale. The newly renovated Saguaro is a feast for the senses. From the zingy colors to the Iron Chef America led casual restaurants, you’ll be intrigued with The Saguaro. The hotel has large brilliant pink bougainvillea plants, towering citrus trees and, of course a Saguaro or two. Each room exterior is accented by the color of a native desert flower, creating a visual spectrum throughout the resort grounds. 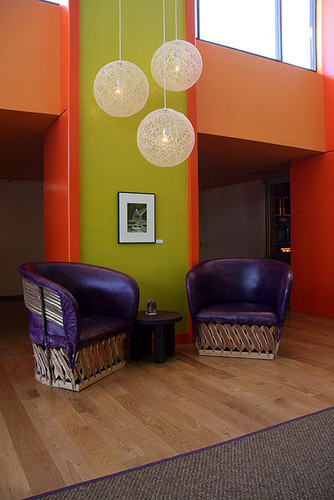 Inside, your room’s primary color is joined by contemporary and natural furnishings in wood and leather, including hand-crafted pieces imported from Mexico. 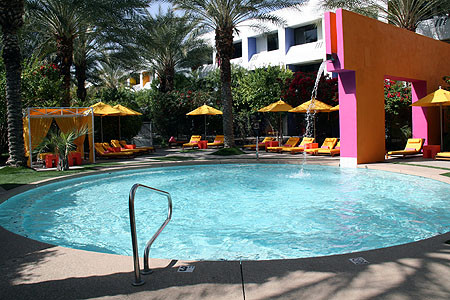 In the center courtyard of one of the buildings you will find a refreshing pool. Some rooms look out over the pool or have a private patio. The Saguaro Restaurants are a real treat. Old Town Whiskey features a veritable library of more than 100 varieties of whiskey, bourbon, rye and scotch; a stunning list of sparkling wines; and a menu of Chef Garces’ bar snacks and tempting raw bar selections. Their outdoor seating and lovely al fresco fireplace will tempt you to come early for Happy Hour. Chef Jose Garces opened Distrito at the Saguaro in December 2011. The expansive menu of small plates draws on the bold flavors of Mexico City, paying special attention to Mexican Barbacoa, or barbecue. Distrito has casual indoor seating and outdoor seating where you can watch people stroll by. And, you can bring your dog to The Saguaro without an extra charge! Full Review of The Saguaro. The Saguaro Photos. Just 20 minutes north, you’ll find the beautiful Hyatt Regency Scottsdale at Gainey Ranch, a full-service resort with towering palms, enticing swimming pools and a championship 27 hole golf course. The Hyatt provides a signature camp for children and families will find special activities ranging from Native American dance performances to live zoo animals. 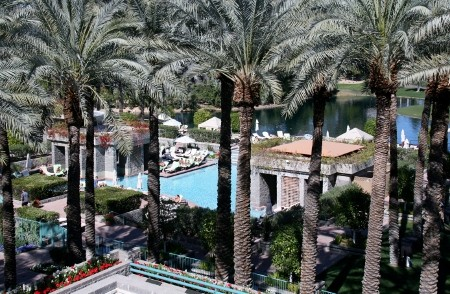 Add in the services of the beautiful Spa Avania, and you have something for everyone at the Hyatt Regency Scottsdale. The landscaping, grassy areas and towering palms add a tropical flair to this desert oasis. And, there is water everywhere. From the ecologically balanced pond, to the rambling swimming pools, water bubbles and flows. And, if it were not for the large specimens of cacti, you might not know you are in the Sonoran desert. All dining venues allow for casual dress yet the cuisine is innovative, fresh and beautifully presented. You can have a burger poolside or dine with attentive service at SWB, a southwest bistro, Alto ristorante e bar or Noh Japanese cuisine. Enjoy indoor or outdoor dining. If you dine at Alto, the Italian gondola rides are free! For a real treat, try the Wine Me, Dine Me dinner. At night, the place comes to life with gondoliers singing to couples in authentic Italian gondolas plying the canals, families having casual al fresco meals around glowing fire pits, live entertainment spilling outside from the lobby and men recounting their day on the golf links beer in hand. The Hyatt Regency also allows pets and sets aside rooms with a grassy patio for those bringing their furry friends. Once you have your “home base” in Scottsdale, you can explore such wonders as the Desert Botanical Garden, Old Town Scottsdale with the Native Trails show and the Frank Lloyd Wright Taliesin West. But be sure and schedule some time to just relax. Each of these hotels has an atmosphere and amenities that will make your Scottsdale vacation a true delight.